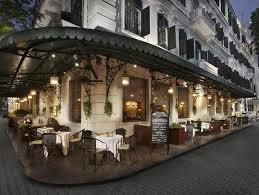 This elegant restaurant offers the best French cuisine in town, refined with a great selection of imported products. Le Beaulieu is particularly famous for evening dinners and Sunday brunches, which have become a tradition for Hanoi residents. Discover the best of Vietnamese gastronomy at the Spices Garden. A healthy and refined cuisine with exotic flavors features Vietnamese’s herbs, spices and other well-known traditional specialties. Enjoy ice-cream, fruit juices and exclusive Metropole tea collection, aromatic coffee or light snacks complimented with exquisite cocktails in a tranquil poolside venue of the peaceful courtyard. La Terrasse du Metropole duplicates the look and feel of a typical Parisian sidewalk café, providing unique and pleasant oasis of French culture in Hanoi. Daily lunch, dinner, tea, coffee, refreshing drinks, cocktails and fine cigars. Le Club is the perfect setting to enjoy a relaxing drink or cocktail. Continental breakfast, lunch, high tea, chocolate buffet and dinner are served accompanied by delightful live piano music. The newly establised Le Spa du Metropole’s treatments artfully blend Eastern holistic rituals with Western contemporary method. The three level spa features lavishly interior design and theme treatment suites making the experience unforgetable.